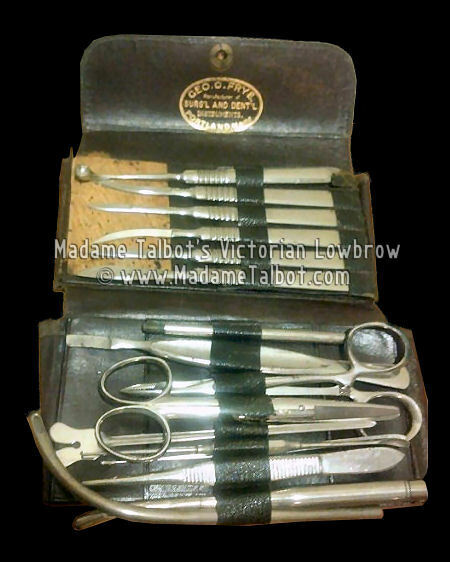 This is a complete surgical kit that belonged to George Frye. There are no instruments missing, all original. This set dates sometime around the 1870s. An example can be found in Vol. 1, Illustration 44, page 28 of "Pictorial Encyclopedia of Civil War Medicine Instruments and Equipment" by Dr. Gordon Dammann. Another example can be found on page 15 in "Illustrated History Series of Civil War Medicine" by C. Keith Wilbur, M.D. Condition of this kit is extremely good.